Steve Smith’s wife, Pamela, was with the family on the visit to Branson but did not go on the boat. Steve Smith’s 14-year-old daughter, Loren, suffered a concussion but survived. Missouri Sen. Claire McCaskill says she’ll examine “legislative solutions” to increase the safety of amphibious vehicles like duck boats after the tragedy in Branson. The Democratic senator didn’t offer specifics after she was briefed Friday evening by officials from the U.S. Coast Guard and the National Transportation Safety Board. Both agencies are investigating the Thursday evening accident on Table Rock Lake that killed 17 people. But she says she doesn’t blame the operator of the doomed boat. 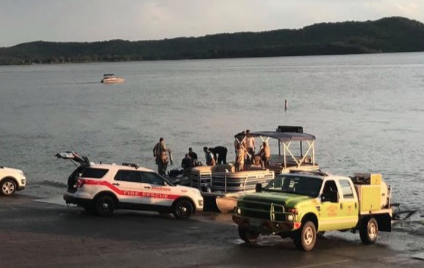 Tia Coleman told WXIN-TV in Indianapolis that she and a nephew were among 11 relatives on a duck boat Thursday night on Table Rock Lake near Branson, Missouri. Coleman says she lost “all my children” but she did not say how many. The local hospital’s president says that an employee of a nearby riverboat cruise line stayed with a small child who survived the capsizing of a duck boat on a Missouri lake for hours until the girl’s father arrived. The president of the company that owns the Branson duck boats says a sudden “microburst” of high winds apparently came up suddenly before one of the boats capsized, killing 17 people. Pattison says his company is “sad” and “devastated” by the deaths. Parson spent Friday in the Branson area after the boat sank Thursday evening on Table Rock Lake amid high winds. He called the efforts of emergency responders and civilian rescuers “courageous” and said he was inspired by them. Cox Medical Center spokeswoman Brandei Clifton says “doctors are confident” about their long term prognosis. Pace says divers indicated that the water visibility was better than normal, expediting the recovery of the victims’ bodies. They ranged in age from 1- to 70-years-old. The office manager at the Stone County Sheriff’s office, Wendy Doucey, confirmed the discovery Friday. The Ride the Ducks boat sank Thursday night in the Lake of the Ozarks near Branson. The victims’ names haven’t been released. Stone County Sheriff Doug Rader said during a news conference Friday that he believes the boat sank in 40 feet of water and rolled into 80 feet of water. He says the Missouri State Highway Patrol divers have located the vessel, which is on its wheels in Table Rock Lake in the Branson area. Authorities plan to recover the boat later Friday. Stone County Sheriff Doug Rader described the search as a “recovery mode for the bodies that are still missing” during a news conference Friday morning. President Donald Trump is extending his “deepest sympathies” to those affected by a Missouri boat accident that has killed at least 13. Allison Lester told ABC’s “Good Morning America” Friday that the “waters were rough” and “debris was flying everywhere” Thursday evening when the Ride the Ducks boat sank in Table Rock Lake in Branson. Lester was on a nearby boat. Lester’s boyfriend, Trent Behr, says he saw a woman lying in the water and that they pulled her up onto the boat. He says she was unconscious and that he was getting ready to start CPR when emergency responders arrived. BRANSON, Mo. (AP) – Dive teams are expected to resume the search for five people missing after a tourist boat capsized and sank in a southwestern Missouri lake. Stone County Sheriff Doug Rader says at least 11 people, including children, died when the Ride the Ducks boat sank Thursday night on Table Rock Lake in Branson. Seven other people were hospitalized. Rader says the stormy weather was believed to be the cause of the capsizing. Another boat on the lake was able to safely make it back to shore. National Weather Service meteorologist Steve Lindenberg says the agency had issued a severe thunderstorm warning for the Branson area, and winds reached speeds of more than 60 mph. The National Transportation Safety Board said on Twitter that investigators are expected to arrive on the scene Friday.